Einstein famously came up with the theory of special relativity in the early 20th century, resulting in a complete shift in the way that physicists dealt with problems involving motion. Instead of Newton’s theories, in which you just calculate the motion of something, in Einstein’s special relativity you have to calculate the motion of something relative to you. In this case, a person who is standing still sees a train moving past at a certain speed. 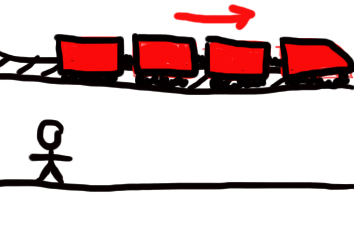 The observer – the little stick figure – sees the train moving past at a certain speed. So, relative to him, the train is moving at the speed it’s actually travelling at. 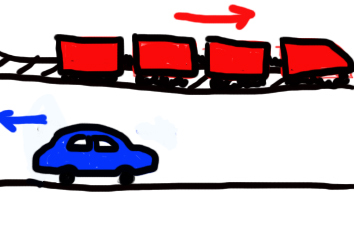 In this case, the car is moving in the same direction as the train. Would the train still appear to be moving at the same speed? In this case, however, the observer is in a car which is moving in the same direction as the train (although probably not at the same speed, unless it’s a very fast car!). 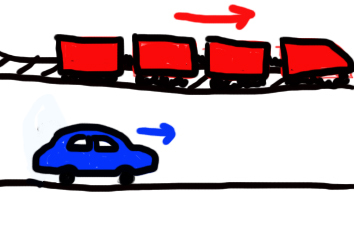 But, because the car is moving in the same direction, the speed of the train relative to the observer is slower than the speed it’s actually travelling. Think about being on a motorway: you’re in a car going at (around) 70mph, but because the cars around you are going at the same speed, you don’t whizz past them: instead, relative to you, they’re not going that much faster or slower. In this case, the train and car are moving in opposite directions. Will the train appear to be faster or slower? There’s also the opposite option: the car and train are moving in different directions. Here, the train now appears to be moving faster than it actually is: if the car’s moving at 30 mph and the train at 70mph, it will appear to the person in the car that the train is moving at a massive 100mph. Again, think about being on a road: if you’re going one way, and cars are passing you on the other, it appears that they’re going much faster than they are. The combination of your relative speeds means that those cars might appear to be doing 60mph, rather than 30mph, for example. Now this might not appear all that groundbreaking. After all, wherever you measure something, it’ll always be relative to you: for example, saying a car is going at 30mph doesn’t take into account the fact that the car is on the Earth, which is spinning much faster (around 900mph!). But to us, standing on the same Earth, the 900mph isn’t really important when we want to know how fast a car is going. However, what’s truly amazing about relativity is the fact that light doesn’t obey it. 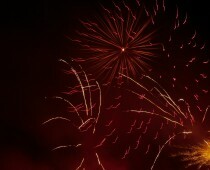 The speed of light – around 300 000 000 metres per second – is constant. So even if you’re in a train, travelling at 100mph in the opposite direction to a laser beam, the light in that beam will still appear to be going at the speed of light. No matter how fast you’re travelling away from, or towards, light, you’ll still only ever see it going at the same speed. This is a big deal for physics. It’s possible to include this fact into theories of motion, so that the maths says that the speed of light doesn’t change – but doing so creates a whole load of wacky side-effects, that only occur when you get close to achieving the speed of light. One example is time dilation, which basically says that as you get close to the speed of light, time slows down. (Yes, really.) It’s actually been tested, using two atomic clocks: one on the ground, and the other on a high-speed plane, and it was shown that the atomic clock on the plane was behind the one on the ground after its flight, despite being exactly the same beforehand.